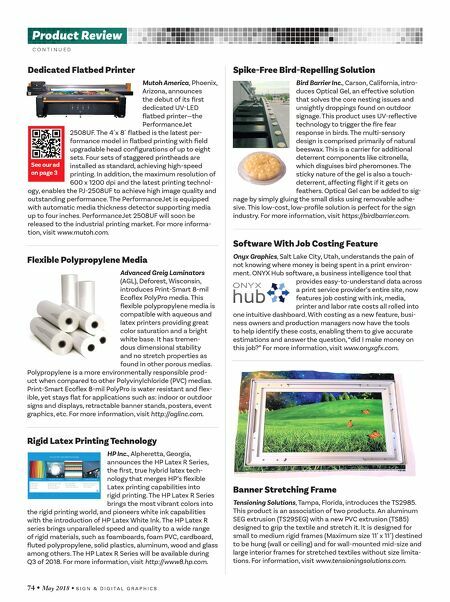 74 • May 2018 • S I G N & D I G I T A L G R A P H I C S Product Review C O N T I N U E D Flexible Polypropylene Media Advanced Greig Laminators (AGL), Deforest, Wisconsin, introduces Print-Smart 8-mil Ecoflex PolyPro media. This flexible polypropylene media is compatible with aqueous and latex printers providing great color saturation and a bright white base. It has tremen- dous dimensional stability and no stretch properties as found in other porous medias. Polypropylene is a more environmentally responsible prod- uct when compared to other Polyvinylchloride (PVC) medias. Print-Smart Ecoflex 8-mil PolyPro is water resistant and flex- ible, yet stays flat for applications such as: indoor or outdoor signs and displays, retractable banner stands, posters, event graphics, etc. For more information, visit http://aglinc.com. Rigid Latex Printing Technology HP Inc., Alpheretta, Georgia, announces the HP Latex R Series, the first, true hybrid latex tech- nology that merges HP's flexible Latex printing capabilities into rigid printing. The HP Latex R Series brings the most vibrant colors into the rigid printing world, and pioneers white ink capabilities with the introduction of HP Latex White Ink. The HP Latex R series brings unparalleled speed and quality to a wide range of rigid materials, such as foamboards, foam PVC, cardboard, fluted polypropylene, solid plastics, aluminum, wood and glass among others. The HP Latex R Series will be available during Q3 of 2018. For more information, visit http://www8.hp.com. Spike-Free Bird-Repelling Solution Bird Barrier Inc., Carson, California, intro- duces Optical Gel, an effective solution that solves the core nesting issues and unsightly droppings found on outdoor signage. This product uses UV-reflective technology to trigger the fire fear response in birds. The multi-sensory design is comprised primarily of natural beeswax. This is a carrier for additional deterrent components like citronella, which disguises bird pheromones. The sticky nature of the gel is also a touch- deterrent, affecting flight if it gets on feathers. Optical Gel can be added to sig- nage by simply gluing the small disks using removable adhe- sive. This low-cost, low-profile solution is perfect for the sign industry. For more information, visit https://birdbarrier.com. Software With Job Costing Feature Onyx Graphics, Salt Lake City, Utah, understands the pain of not knowing where money is being spent in a print environ- ment. ONYX Hub software, a business intelligence tool that provides easy-to-understand data across a print service provider's entire site, now features job costing with ink, media, printer and labor rate costs all rolled into one intuitive dashboard. With costing as a new feature, busi- ness owners and production managers now have the tools to help identify these costs, enabling them to give accurate estimations and answer the question, "did I make money on this job?" For more information, visit www.onyxgfx.com. Banner Stretching Frame Tensioning Solutions, Tampa, Florida, introduces the TS2985. This product is an association of two products. An aluminum SEG extrusion (TS29SEG) with a new PVC extrusion (TS85) designed to grip the textile and stretch it. It is designed for small to medium rigid frames (Maximum size 11´ x 11´) destined to be hung (wall or ceiling) and for wall-mounted mid-size and large interior frames for stretched textiles without size limita- tions. For information, visit www.tensioningsolutions.com. See our ad on page 3 Dedicated Flatbed Printer Mutoh America, Phoenix, Arizona, announces the debut of its first dedicated UV-LED flatbed printer—the PerformanceJet 2508UF. The 4´x 8´ flatbed is the latest per- formance model in flatbed printing with field upgradable head configurations of up to eight sets. Four sets of staggered printheads are installed as standard, achieving high-speed printing. In addition, the maximum resolution of 600 x 1200 dpi and the latest printing technol- ogy, enables the PJ-2508UF to achieve high image quality and outstanding performance. The PerformanceJet is equipped with automatic media thickness detector supporting media up to four inches. PerformanceJet 2508UF will soon be released to the industrial printing market. 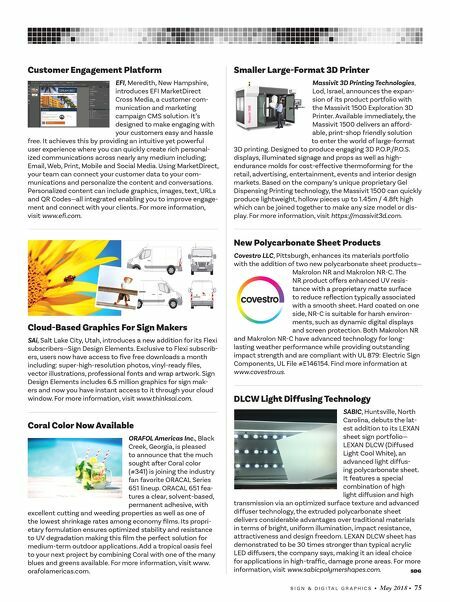 For more informa- tion, visit www.mutoh.com.